The Eastern Province is one of the three provinces of Sierra Leone. It covers an area of 15,553 km² and has a population of 1,641,012 (2015 census). Its capital and administrative centre is Kenema. Eastern Province, the centre of the country's diamond mining industry, is very mountainous and has two ranges, the Gola Hills and the Loma Mountains. The Eastern Province is the heart of Sierra Leone's diamond mining activity. The precious stone was first discovered in around the 1930s, and has played a major part in the region's history ever since. Most diamonds are mined and exported by small local enterprises, numbering around 200,000 to 300,000; some of these are illegal, while many are officially sanctioned. Additionally, there are a handful of foreign countries carrying out larger scale diamond mining. The Eastern Province borders the Nzérékoré Region of Guinea to the northeast, the Liberian counties of Lofa, Gbarpolu and Grand Cape Mount to the east and south, and the Sierra Leonian Southern and Northern provinces to the west and northwest. Eastern Province is the only region of Sierra Leone without any shoreline. The province is home to the Gola Hills, a tract of rainforest with fauna including chimpanzees, western red colobus, many endemic species of bird, and a sparse population of pygmy hippopotamus. The other main area of wilderness is the Loma Mountains, which lie mostly in the Northern Province, but also extend into the northern part of the Eastern Province. The province is divided into 3 districts. 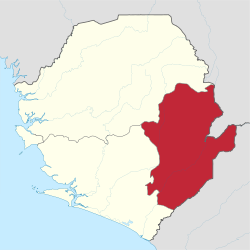 They are: Kailahun District, based around the city of Kailahun; Kenema District, which is headquartered by the provincial capital Kenema; and Kono District, headquartered at Koidu. ^ Bah, Saidu (1 April 2016). "Sierra Leone News: We are 7,075641 people – Census". Awoko. Retrieved 7 November 2016. ^ University of Michigan (2008). "The Place is So Backward": Durable Morality and Creative Development in Northern Sierra Leone. p. 43. ISBN 9780549511755. ^ Manson, Knight & McClanahan 2012, p. 253. ^ a b c Manson, Knight & McClanahan 2012, p. 272. ^ a b MapAction (21 October 2014). "Reference Map of Eastern Province, Sierra Leone". Retrieved 7 November 2016. ^ Manson, Knight & McClanahan 2012, pp. 263-264. ^ Manson, Knight & McClanahan 2012, p. 312. Manson, Katrina; Knight, James; McClanahan, Paige (2012). Sierra Leone. Bradt Travel Guides. ISBN 9781841624129. Wikimedia Commons has media related to Provinces of Sierra Leone.